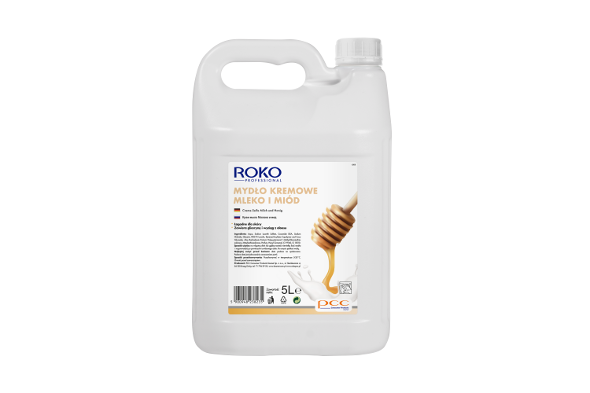 ROKO PROFESSIONAL CREAMY SOAP milk and honey is a creamy, liquid hand and body soap with a gentle milk and honey fragrance. It is gentle to the skin. Features very high content of surfactants and enriching additions. Creamy liquid soap with addition of glycerin, lanolin and aloe extract for washing and care of the skin. Aloe extract soothes irritation. By penetrating into epidermis glycerin retains water in its deeper layers and smooths the skin. Lanolin perfectly conditions and lubricates the skin and provides softening properties. The product is intended for professional use. soap liquid soap cosmetic soap antibacterial soap hand washing.